I recently installed MakeMyTrip app on Android to book a hotel for my vacation. The app was good and in fact I booked a hotel and enjoyed my trip. But the biggest problem with the app is that, it sends out too many notifications (deals, promotions etc…) and that was really annoying. Now imagine, if you had switched off mobile data or Wi-Fi for few days and later when you turn it On, the app is going to bombard with notifications (seriously!). 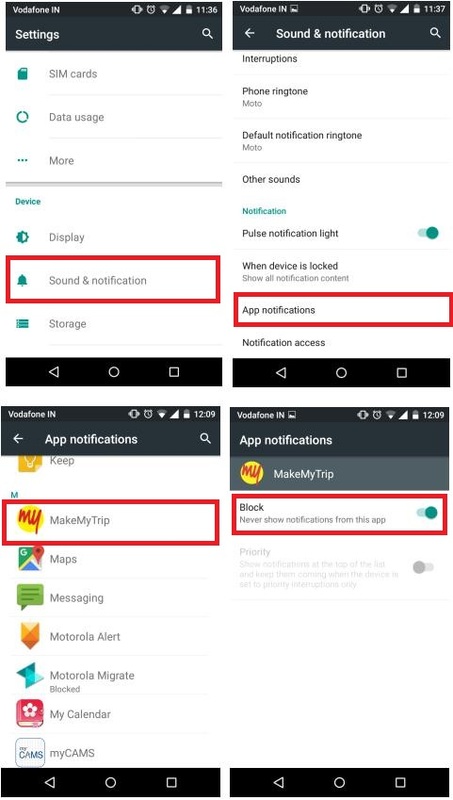 There are few apps that allows you to control notifications (comes as a built-in feature), but apps like MakeMyTrip does not provide any setting to disable its notifications. So instead, I had to rely on Android’s feature to block or turn Off annoying notifications of specific apps. In this article, I’ll be showing how to disable notifications for specific apps on Android Lollipop, however the steps should be similar on most of the Android versions. Thank you, thank you, thank you. And, again thank you.